All you need to use Ex Tutorial Island is a VIP subscription at TRiBot. After that it’s free to use for unlimited instances! You can activate Ex Tutorial on the TRiBot repository. Using the TRiBot menu, navigate to View > Account Manager and add your account. Load a Runescape client, click ‘Start Script’, select ExTutorial from scripts, and your Runescape account in the dropdown box. In order to use account creation, you’ll first need a 2captcha account. 2captcha is a service that solves captchas for you, like the “I’m not a Robot” box on the Runescape account creation page. You can sign up for 2captcha using my affiliate link here. Luckily, it’s cheap, and costs only ~$1.30 per 1,000 captcha solves. Follow step 2 from above, but this time, don’t select an account. Adjust the script settings to your liking. twocaptchakey: Your 2captcha API Key. This can be found after logging into your 2captcha account. 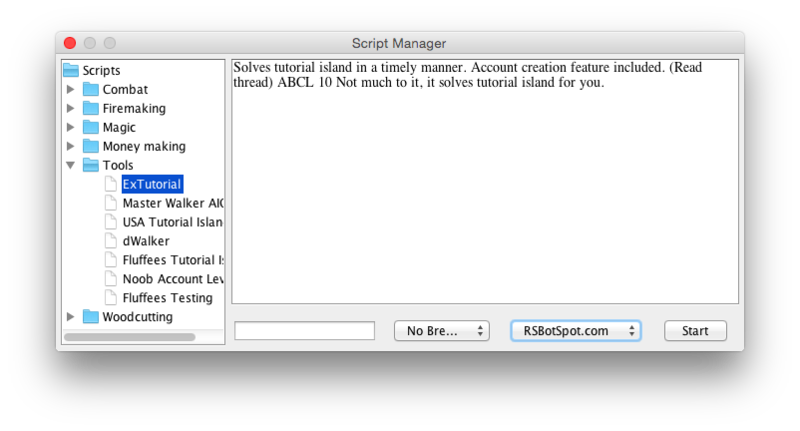 After you’ve edited the script arguments to your liking, paste them into the text box on the TRiBot script manager (see above image), and click ‘Start’. Ex Tutorial Island is extremely simple to use, and does its job well! While we’ve had a great time using the account creation feature in the past, at the time of testing it was broken. The small amount of settings makes for quick and easy usage, but we’d also love to see more customization options for those who want more control over the process.